Air in the capital turned a yellowish hue as sand from China's arid northwest blew in, turning the sky into a noxious soup of smog and dust. At 6 a.m. local time, the U.S. Embassy's air quality index showed a reading of 516 for particles less than 2.5 micrometers in diameter. Known as PM2.5, such particles are considered particularly dangerous because they can lodge deeply in the lungs. On the American air pollution index, the air at that time and throughout much of the morning was classified as "beyond index." Sathya...Do you have any idea (rough guess will do) of the welfare gains per dollar spent on renourishment? I haven't seen any estimates of return on nourishment investment. My back of the envelope calculation based on just the hedonic valuation in NC would be $3 per dollar spent. For an average ocean front property valued at approx $800000, the semi log hedonic coeff (accounting for endogeneity of width) of 0.11 suggests a value of $8800 per foot of beach width. With the cost of nourishment sand is approx $5 per cubic meter and fixed cost of $1000000. The cost per foot of nourishment per ocean front home would be approx 2300 (assuming costs are distributed across 50 homes along a 1km stretch of the coastline, and a limiting nourishment depth of 10m). That would be $6500 net gain, which is approx a $3 for every dollar spent. We used a similar calculation of net benefits in [our] JEEM paper simulations. Well played Sathya. I'm sure you recognized the influence our blog will have on your readership. While officials including U.S. Rep. Mike McIntyre (D-NC7) have said every dollar invested in beach nourishment returns $320 in tax revenues, ASBPA in a press release Tuesday said the return in 2012 was as high as $570. That number, 320/1, sounds high, but even so taxes are transfers so the net effect is zero. Beach nourishment spending should be compared to the consumer surplus gains of the beach trips and the value of protected property to determine if nourishment is a good idea. Alaska will be hit with the second-highest cut in grants for fish and wildlife protection, to the tune of $2.1 million. That's more than every other state except Texas. We are proud to announce the launch of the latest RePEc initiative, the RePEc Biblio. This is a hand-selected collection of the most relevant articles and papers on a wide variety of economics topics. RePEc Biblio is organized as a tree, narrowing the topics as you follow its branches. The RePEc Biblio lives from the contributions of volunteer editors. Consider helping out if you have taught a class on a topic and have already put together a literature list. Feel also free to contribute your vision of the best papers from your area of research. Volunteer editors are welcome to sign up to populate the tree, either by contacting the manager or the relevant topic editor who can open a sub-topic or sub-sub-topic. We are looking for editors in both the broadest and narrowest fields. And to encourage good editing, readers can rate the topic entries. Note that IDEAS links from papers, articles, editor profiles, and JEL codes to the relevant RePEc Biblio topics. Authors also find mention of their papers in RePEc Biblio on their IDEAS citation pages. This is a great idea. 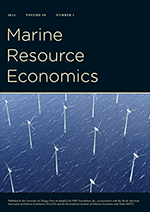 So great that I volunteered to edit the contingent valuation section of the tree and the environmental and resource economics editor, Richard S.J. Tol, accepted my offer. I spent an iced in Tuesday developing a CVM reading list with a bunch of my favorite papers (including a few too many of my own), instead of working on things with real deadlines. If you see anything I missed, or something I've written that is so bad that it shouldn't be included, please let me know in the comments section, via email or rate the topic entries. If you'd like to edit a branch or a twig of the RePEc Biblio all you do is ask the editor. What would you do with additional tax revenues this week? Jack Lew, the White House nominee for Treasury secretary, says President Obama’s second-term vow to confront climate change will not lead to proposals to tax carbon dioxide emissions. “The administration has not proposed a carbon tax, nor is it planning to do so,” Lew said in written responses to Sen. Orrin Hatch (R-Utah), the top Republican on the Senate Finance Committee, which will vote on Lew’s nomination Tuesday. “Given the enormous tax increase that would result from a carbon tax, how would you advise the president to use carbon tax revenues? What would your highest priorities be?” Hatch asked. Lew declined to get into the idea, offering his one sentence vow and leaving it at that. The White House nominee for Treasury secretary apparently has no idea. Daily demand and supply: The "crack spread"? That is a new term for me! The Energy Department’s in-house number crunchers say recent gasoline price spikes can’t really be laid at the feet of crude oil prices, which generally play a big role in what drivers pay at the pump. Instead, a brief Energy Information Administration report Monday explains that several factors, such as refinery outages (both planned and unplanned) and growing global demand for petroleum products, account for most of the rise. Between January 1 and February 19, the price of Brent crude oil—the waterborne light sweet crude grade that drives the wholesale price of gasoline sold in most U.S. regions—rose about $6 per barrel, or about 15 cents per gallon. A simple calculation, which modestly understates the role of higher crude prices to the extent that crude price increases during December 2012 were still not fully passed through in retail gasoline prices at the start of 2013, suggests that about two-thirds of the rise in gasoline prices since the start of the year reflects higher gasoline crack spreads. Finally, here in Washington there are some details on Judy Clibborn’s transportation package. See the links at the bottom of her press release, especially the Fact Sheet showing that half the funds go to new projects (I-5, I-90, 167, 509, 395) and only 7% goes to maintenance of the state system. That’s only $631m for maintenance of the state system despite the need (identified by Connecting Washington) of $3.1 billion. (And of course Connecting Washington identified $4.9 billion in maintenance needs at the city and county levels; Clibborn’s proposal provides $675m in assistance.) BTW, Sightline’s Clark Williams-Derry reminds me of their estimate that each new lane-mile of urban highway creates up to 186,500 tons of CO2 over 50 years. ...and they enter the workforce two years sooner. ...and the education costs less. So, to what extent are community colleges doing just as good of a job at signaling/sorting college age students as four-year degree programs? Brace yourself, sequester is coming! The news has been filled with horror stories over the pain threatened by the sequester cuts. ... these stories have one thing in common: A lot of emphasis on how modest federal budget cuts will impose outlandish costs, and absolutely no mention that plausible alternatives–increasing taxes, increasing the national debt ever higher–would also impose real economic burdens. The one alternative to the sequester that does merit brief mention, that Congress actually passes a bill that selectively cuts spending, is widely agreed to be implausible. Now I’m sure that some reporters are out there doing their job, not just reporting the obvious fact that recipients of federal dollars would rather just keep the money flowing, but also reporting that federal spending itself comes at a cost. But such news reports are rarer than rainbow-colored unicorns these days. Head over to Knowledge Problem for the official rules.